Precision Attachments The Locator Root Attachment Kit features patented dual-retention in the only self-aligning precision attachment. With Locator Root Attachments, Zest Anchors has introduced the only selfaligning precision attachment. 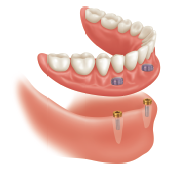 This innovation, says the manufacturer, allows patients to easily seat overdentures without the need for accurate alignment of the attachment components.